I think I like the abbreviated format I used for the last two Rurouni Kenshin movies. I shall apply it again here. Hiro Hamada (and I’m struggling to not write “Hamada Hiro” instead of “Hiro Hamada”…) is a teenage robotics genius who lives with his elder brother, Tadashi, under the care of their aunt. Hiro gains entry to the same university as Tadashi when he presents his latest invention – microbots – at the university’s exhibition. Tragically, Tadashi is killed in an accident on the same day. 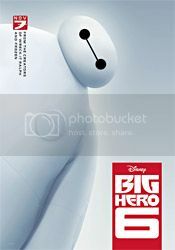 But Tadashi leaves behind his invention – a robotic healthcare assistant named Baymax. Hiro accidentally activates Baymax one day but doesn’t think much of it until Baymax (following and Hiro’s last remaining microbot) leads him to discover that a mysterious masked man is making more microbots just like his. Hiro forms a team with Tadashi’s university friends – Wasabi, Honey Lemon, Gogo and Fred – to track down the masked man, whom he suspects of having started the fire that killed Tadashi. Set design. The story is set in San Fransokyo, a fictional futuristic city where Tokyo and San Francisco somehow got mushed together. The look of the place is very very much a combination of the two places, and it looks rather charming. I’ve seen quite a lot of the concept art for this film floating around on Tumblr, where several of the concept artists posted their work and clearly a lot of thought and imagination when into the creation of this place. I don’t think there was anything really awful about it. At most I’d say I didn’t care much for the whole portal-into-space angle. It might have been more interesting if they had restricted the threat to something smaller, but perhaps something of a smaller scale wouldn’t have required Baymax or any of the fancy science-ish thinking? Oh wait, just thought of something. The villain was a little too obvious. It probably wouldn’t be as obvious to kids, but to seasoned moviegoers, it would have been clear pretty early on. I wish it had been a little more complex than it was.